It is a week since we witnessed the horror of this human tragedy. It seems that since the Great Fire of London in 1666, successive governments have limited their concern for providing safe and secure habitation for the people under their care. Grenfell Tower is a frightening indictment of political, financial and religious doctrines that are now no longer fit for purpose. We live in an era of ‘professional’ politicians who, in leadership roles, care more about their power than the people. Our current Prime Minister initially ignored the survivors of this tragedy and then, urged by her advisors I am sure, sickeningly gushed over the families of victims of a terrorist attack just days later. They are servants to global corporations who finance their election efforts and hence the continuing low turnout from voters, who know they are now limited in ability to sway political opinion. Our financial system too, is outdated and in chaos. Every single aspect of the Grenfell Tower horror, from the blazing building to the rescue services (who did superbly), were affected by lack of financial resources and dwindling budgets. ‘Austerity’ is not a financial discipline, (to show we are being prudent), but a tool by which financiers can grab sovereign assets cheaply. We have seen this in Greece, where everything from their beautiful islands to even their water supplies have been sold off to private interests at knock down prices. This, from odious moneylending practices that create unrepayable debt and sovereign servitude – the very essence of how and why ‘Austerity’ is implemented. Creating money is simplicity itself. When you and I take out a loan no money changes hands! A computer entry is placed in your bank account for say, £1,000 and a similar entry is placed in the banks account, showing that loan as an asset to ‘balance’ the books. No gold has been sold. No cash has been taken out of the banks vaults. It is simply created out of thin air, which we then pay interest on. ‘Austerity’ becomes a sordid joke as the amount of money put into the economy is dictated by the private banks, who have been authorised by government to run this very lucrative and controlling function of Society. Any amount of money can be supplied to Society but the banks only allow sufficient to keep us in permanent debt to them. For evidence look at the trillions of Q E printed by the Federal Reserve in the US and the ECB in Europe and passed directly to banks to buy their bad debts, (created by lending money to people they knew could not afford to repay). That money bypassed Society, who were forced into the type of ‘Austerity’ measures that caused the horror of Grenfell Tower. In Germany and other countries there are public banks, run by the local authorities who support small businesses and their community infrastructures – Health, Education, Police and Fire services etc. No wonder Germany is financially strong and why the ECB want to close them down and transfer their services to private banks. Finally, in the past our traditional religious establishments have been responsible for the moral fibre of Society. In my lifetime, these values and power have been eroded by the growing worship of money and what it can buy, eroding integrity and moral fibre in the process. The loss of power and influence of Western religions, in my opinion, reflects their inability, or desire, to bring their beliefs into the 21st century to reflect the world in which we now live. This failure, in turn, has diminished their ability to exercise any integrity and moral fibre over how our political and financial institutions do business. 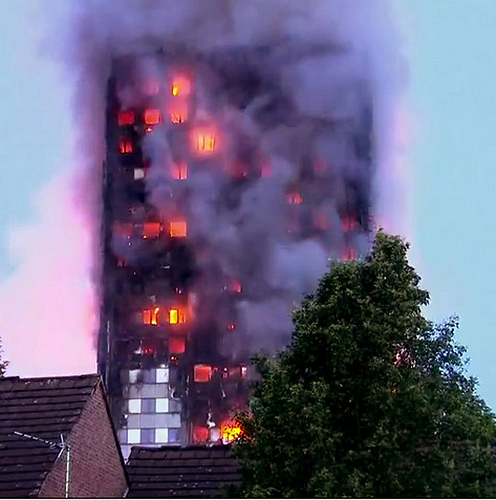 This erosion of morality has resulted in the horror of Grenfell Tower. It highlights how ‘money’ desperately needs cheap labour but refuses to then take responsibility for looking after that labour, through the conduit of political policy and action which it so heavily influences. We are in a whole new (global) world now, where antiquated taxes, political practices and a wholly unsupportive financial system* can be seen to be hopelessly out of place in serving Society’s needs. What I am now looking for is a political party who can ‘repackage’ this country, by providing an infrastructure that supports the efforts of business as well as the community, providing transport infrastructures, premises, employees (as well as Health, Education and Community services for their employees, retirees and their families). That infrastructure has to be paid for and that must come from creating public banks to service local authorities, together with a whole new tax system that ignores where a company’s headquarters are based but instead charges that corporation each time it uses our country’s facilities. A ‘Transaction Tax’ that they and their customers pay on every financial transaction, from buying a hairpin to making a derivatives trade. Nothing is excluded because ALL use the infrastructure to make that transaction, in one format of another. You Use It . . . You Pay – no matter where you live and work from! We need leaders with this sort of new vision, which addresses the many abuses Society increasingly face with current 18th century thinking. They must address global warming, the education and future of our young (do they have one anymore) and an ageing Society that has given us its support and now requires our support in return. Above all, they must urgently address the impact of IT upon future employment and create new employment opportunities for our young. Society is getting more and more angry with each passing abuse that comes to light and that anger is waiting to be converted into the means by which we build a new and more caring Society. Are there people out there who want to use their power to this end? Society is in desperate need now, to avert another Grenfell Tower. This entry was posted in Global Magna Carta and tagged Austerity, Banking, Corporations, Democracy, Grenfell Tower, New Thinking, Odious Debt on June 21, 2017 by John Coombes.